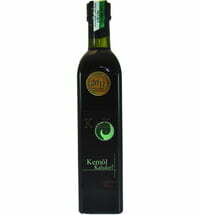 The cold-pressed, highly aromatic oil with the deep green colour has a unique, nutty flavour and is a staple condiment in Styria, Austria. The unmatched flavour as well as its valuable ingredients and health-promoting properties make it indispensable in the kitchen. Pumpkin seed oil is a salad dressing classic and can be drizzled over all kinds of salads, pumpkin soup and scrambled eggs. 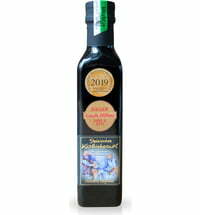 Its versatility knows no bounds: seed oil refines dips and sauces and it is also increasingly being used in desserts (e.g. pumpkin seed oil crescent biscuit, pumpkin seed oil Bundt cake, etc.). It adds great flavour to vanilla ice-cream. Form delicious pumpkin seed crusts meat dishes and sweets dumplings. Other serving suggestions can be found in our selection of recipes. Pumpkin seed oil contains many minerals, trace elements such as selenium, is high in vitamin E, valuable monounsaturated and polyunsaturated fatty acids, protects against free radicals and may reduce cholesterol levels. It is said to have a positive effect on the immune system by reducing blood pressure, preventing bladder problems and protecting the prostate. In folk medicine, pumpkin seed oil also carries the synonym "Styrian Viagra". 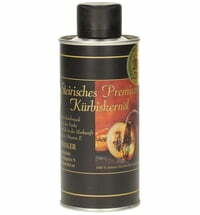 The Styrian pumpkin oil ripens best in a mild climate on loamy sand soil. The fruits weigh between 8 kg and 10 kg and contain up to 1000 seeds (pumpkin seeds). In the past, these seeds were scooped out by hand. In smaller companies these techniques are still being practiced today. The seeds are then washed and gently dried. The seeds can then be stored, and if necessary, be freshly pressed throughout the year. The dried seeds are ground and mixed with water and salt then roasted. While stirring continuously, the water starts to evaporate. A mash, the so-called "oil cake" is produced. In the past the seeds were pressed using a a wooden device ("Ölkuh"- "oil cow"), which used a beating motion with a wooden wedge. This device was operated manually. Today the seeds are pressed hydraulically. For one liter seed oil approximately 35 pumpkins are required! 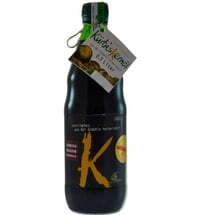 Glanz-Pöltl Orchards Apple and Grape Frizzante "Johanna"